It’s been a while since I posted here so I figured I would give a bit of an update on what’s going on in my life. About a month ago I sold off a large majority of my poker websites.Â I kept a handful to keep me with a bit of an income stream, but for the most part I am pretty much out of the poker game.Â The main reason I did this is because I was getting fed up with the constant stories of affiliate programs changing their terms and screwing over their affiliates plus I really wanted to try and start expanding into other industries. At the time I was selling everything I was working on a project to build a casino site about the best casinos online.Â Since I already started with that project I figure I will continue building the site (which is almost done) then start focusing more on my plans to do things in other industries.Â I am really happy with this site so far, and think the design is incredible (thanks Will!). Recently I made it out to Prague for the iGaming Super Show which was a lot of fun.Â There I caught up with some old friends and got to meet some people that I had spoken to many times online but never met such as Roger (congrats on finally making it out to an event ;)).Â The highlight of the trip was definitely the CalvinAyre.com party which consisted of an old sewage plant that was still active, many midgets, beautiful women, all sorts of Mad Max characters, overhead jousting, a drum band, unlimited booze, pyrotechnics and much more!Â Unfortunately I didn’t bring my camera, but you can see a bunch of the pictures from that party here. 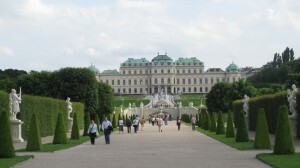 While over there I also managed to get down to Vienna for a couple of days, which was a very beautiful city (I added a pic of Belvedere Palace which is now a Museum to this post). Once I finish up with the casino site my next plan is to build a kind of Men’s Online Magazine which will be sort of a cross between Askmen.com and Forbes.com.Â I really don’t know how it will do but it is more something I want to do for fun and think that it could have great potential.Â Also I am kinda new to other types of online marketing so it will be a bit of a learning experience. Anyway, that is all for now, and I will try and get some more interesting posts up soon. Great site Graham. Only issue I noticed is the rollover color of the right hand menu links. Right now the link rollover color almost merges with the background…..make it a bit different. Again, great design. Good luck!